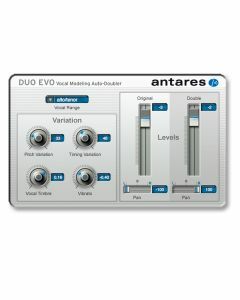 Simply put DUO EVO on your vocal track, adjust the Variation parameters to create exactly the doubled voice you're looking for, and hit play. Instant doubling. Throat Evo Modelling - In addition to allowing programmable variation in pitch, timing and vibrato depth, for even more realism, DUO EVO also includes a simplified version of THROAT EVO's vocal modeling to provide timbral variation for the doubled part. So you can create a doubled part that sounds like the same person as the lead vocalist or someone else entirely. Output - DUO EVO's output section gives you independent control of the level and stereo position of the original and doubled voices, so you can essentially choreograph your two singers. Allows variation in pitch, timing and vibrato depth, and a simplified version of THROAT EVO's vocal modeling to provide timbral variation for the doubled part.